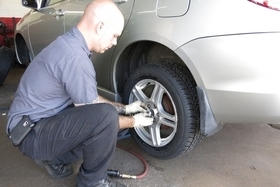 Chase Whipp, tire technician for Cuyahoga Falls, Ohio-based Leipold Tire Co., installs a Cooper tire on a vehicle. AKRON—Most Cooper Tire & Rubber Co. dealers are apprehensive about the recent news that Apollo Tyres Ltd. has reached an agreement to purchase Cooper, and they say it's too early to tell how they will be affected. However, one sentiment persists—that a selling point to customers that Cooper is a home-grown "American" company no longer applies … and they're not exactly sure what that will mean for future sales. Dennis Leipold, owner of Cuyahoga Falls, Ohio-based Leipold Tire Co., which sells Cooper tires, called Apollo Tyres Ltd.'s buyout of Cooper Tire & Rubber Co. "surprising." "I'm disappointed an American company is being taken over by a foreign enterprise and concerned about the direction, not just our tire industry, but our country is going with foreign ownership," he said. Leipold's sons, Andy and Ben Leipold, manage day-to-day operations for the dealership, and his grandson Landon Leipold, 17, works as a tire technician at the company's Cuyahoga Falls outlet. "My second generation is running it and my third generation is coming in, and I'm concerned what's going to be here for them when all the rubber companies are foreign-owned," Mr. Leipold said. Despite his disappointment, he said his company plans to remain a Cooper dealer, as the tires have been strong sellers for his business. William Watkins, owner of Owego, N.Y.-based wholesaler Moore's Tire Sales Inc., said Apollo's acquisition of Cooper probably wouldn't change his dealings with Cooper much, at least for the first few years. His approximately 4,000 sub-dealers, however, are very concerned. "My phone's been ringing off the hook since the deal was announced," Watkins said. "The biggest thing to them is that Cooper is not going to be an American company any longer. That was what they hung their hats on, and how they moved the tires. That's a hurter for us as a wholesaler." Cooper representatives called Watkins to discuss the acquisition with him and explain the reasons for it, he said. But Watkins said he was still somewhat mystified about the deal. "For one thing, Apollo isn't nearly the size of Cooper," he said. "Why didn't Cooper buy them? I don't know if they have the ability to maintain this type of operation or its customer base." Allan Harry, controller at Jensen Tire & Auto in Omaha, Neb., called the deal "hard to analyze totally yet, but we have seen some temporary changes to some pricing. … It's just hard to say." "We are concerned of the fact it is now not a U.S. company any longer," Harry continued, "and see if that means anything to anyone. "Of course, you're not sure where things are going to be produced, if there's going to be major changes on production, that type of thing, because we do like to talk about (Cooper) being a U.S. company—things like that." He said Cooper has offered "some promotional pricing" but "they did put a halt on some specials"—a situation he acknowledged could be temporary or "permanent." Harry simply didn't have enough information to go on, but added, "typically that means prices going up." Jensen Tire has 22 outlets and boasts on its website that the dealership has been "family owned since 1973." Kim Sigman is a partner and general manager at Phoenix-based Community Tire Pros & Auto Repair. He admitted he has received "a lot of information from Cooper on this that I haven't even had a chance to read." That included emails with about five different attachments he hasn't had a chance to digest. "All I can give you is my gut reaction when I first saw (the news)," he said. "I was a little disappointed to see another American-owned company, you know, sold out to foreign interest. "And it may or may not be a good deal. I have no idea. I don't think anyone knows at this point, but you know, time will only tell that." While he doubts the acquisition will affect his business, Sigman quickly added: "I don't have a crystal ball, and I don't know for sure." Sigman said one of the things Community Tire Pros likes to promote to customers when selling Cooper tires is that it's "an American-owned company" and "up until recently, it was all American-made. Now, that's not the case anymore, I realize. "So I don't know how the reaction is going to be. We just won't necessarily mention it in our sales pitch anymore." With the uncertainty of the situation, he's not sure how—or if—the deal will affect his sales of the Cooper brand. "To be honest with you, it probably won't—but again, I don't know for sure." Tire Business reporters William Schertz, Miles Moore and Jennifer Karpus contributed to this report.